QuickTeller is one among the best apps in Nigeria where you can easily send money around all Nigeria banks. With Quickteller app you don’t only transfer money but it also allow you to pay bills such as DSTV, Startime and other related bills. In this article i will be showing specifically how to transfer money using QuickTeller app. With the steps in this post you will find it very easy to send money from one bank to another right from your android phone using QuickTeller app, but before then let me show you some reasons why you need to use this app in making transactions. Wither you choose to use QuickTeller app or not in making transactions, in whatever app you choose to use, there are always charges even when you use USSD codes. But below are some of the major reasons why QuickTeller can be more preferable. unlike when you use your bank USSD codes in making transactions, all your datas are been wiped off immediately after successful transactions. This can be very dangerous when you do online businesses or other form of businesses which requires you to drop payment proofs after payment. Since the data are been removed then it will make you hard to get them back unless you go to the bank. The QuickTeller app is made flexible and easy to use. even a newbie can use it for every kind of transaction as the menu are self explanatory. check below image. 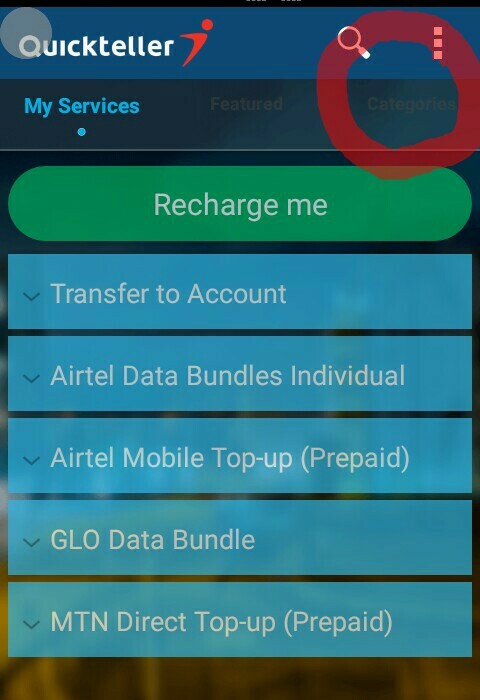 Recharge, Send money, receive money and pay Bills: These are the major features of the app which everyone can easily use by selecting desirable option from the menu. When using USSD codes in making transactions, every page you load attract money and at the end you will notice you have used over 100naira just to make one transfer. This issue usually happen to me when using Bank codes in making transfer. I remembered very well that i used 500naira airtime when making transaction of 10k because of bad bank network. After reaching the final stage i keep getting error message and as soon as i start afresh another charges are attracted. Just like that till it finally work but before then i have wasted alot of airtime. QuickTeller only charge you 52Naira for every successful transfer and 0naira when you buy airtime or buy data bundle. Download QuickTeller app from Google Playstore or directly here open the app and Signup if you’re new to QuickTeller after that you can now login your account. After successful login, click on categories as shown from below image. Now you will be taken to the app quick navigation category. but since we want to do transfer, just click on send money. From the next page select Send to Bank Account. Now fill in the bank details and other necessary details of the receiver and click the next button. Wait for the page to load and you will get a message that your transaction is successful. Now it’s all done. This same process is also applicable when you use the QuickTeller.com website. You can also use the same card payment process to buy Airtime, Buy Data, Pay Dstv and other bills with ease. Kindly share this post if you find it helpful and don’t forget to subscribe for more updates.